The gang gets a box that needs delivered to the moon and Fry is excited until he finds out that the moon is now home to a tacky amusement park. He still longs to explore the barren moon landscape. It feels a little more serious than most other episodes, but it also has little past the initial exploring the Lunar Park. 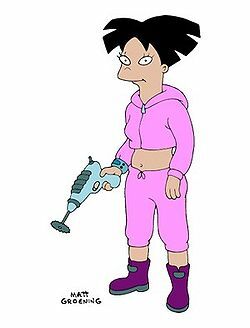 It does not connect to any of the big Futurama continuing plotlines, and there is no guest star of note which leaves us with an episode that finishes the set up form the pilot but is forgettable. While the show is kind of forgettable, it does have some highlights. The mixed up history that is what the original moon landing has become is hilarious. From the Honeymooners as the first astronauts to the gophers and Whalers on the moon all of it is down right funny. Also the names of common place things in the background contain some pretty good jokes, such as the arcade games Mortal Kooperation and Gender Neutral Pac-person and the redneck farmers hat the proclaim “the moon will rise again.” And the topper is Bender’s little speech when ejected from the park “I’m gonna build my own theme park, with blackjack and hookers, in fact forget the theme park.” Which he then repeats when Fry and Leela leave him out of the lunar Lander. Episode 2 is definitely not one of the best Futurama episodes, but it has enough highlights that even though the plot is a bit limp it is still an entertaining half hour of Television. Bad Futurama is still better than anything else. Episode 2: The Series has Landed	Futurama’s second episode takes the crew to the moon on their first mission. Before that though, we meet the rest of the main cast, Hermes, Zoidberg and Amy. Hermes is the resident bureaucrat, Zoidberg is a lobster doctor and Amy is a rich intern. 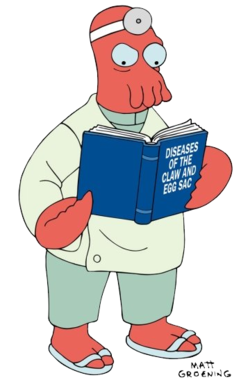 The best of these three is Zoidberg who over the course of the show goes from merely a bad doctor to being broke and living off garbage. Amy too gets plenty of screen time. 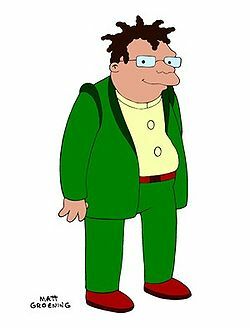 Hermes always seemed the member of the main cast that the most underutilized, as though the writers could never really figure out what to do with. He gets a few episodes of focus, but none of the Hermes heavy episodes are classics. But among the other cast members he is usually good for a line or two. All in all the second episode has more going on than the first, but the show has still not reached the heights it will later	The gang gets a box that needs delivered to the moon and Fry is excited until he finds out that the moon is now home to a tacky amusement park. He still longs to explore the barren moon landscape. It feels a little more serious than most other episodes, but it also has little past the initial exploring the Lunar Park. 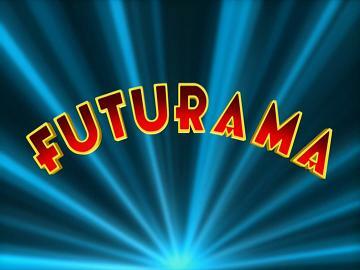 It does not connect to any of the big Futurama continuing plotlines, and there is no guest star of note which leaves us with an episode that finishes the set up form the pilot but is forgettable. While the show is kind of forgettable, it does have some highlights. The mixed up history that is what the original moon landing has become is hilarious. From the Honeymooners as the first astronauts to the gophers and Whalers on the moon all of it is down right funny. Also the names of common place things in the background contain some pretty good jokes, such as the arcade games Mortal Kooperation and Gender Neutral Pac-person and the redneck farmers hat the proclaim “the moon will rise again.” And the topper is Bender’s little speech when ejected from the park “I’m gonna build my own theme park, with blackjack and hookers, in fact forget the theme park.” Which he then repeats when Fry and Leela leave him out of the lunar Lander. Episode 2 is definitely not one of the best Futurama episodes, but it has enough highlights that even though the plot is a bit limp it is still an entertaining half hour of Television. Bad Futurama is still better than anything else.